Fans of the Fab Four are in for a real treat this month when Fife-based tribute band Just Beatles take to the stage at The Alhambra Theatre in Dunfermline on April 12. The group have firmly established themselves on the tribute band scene across Scotland and have received invitations to play at Beatles festivals all over the UK and Europe, including the world famous International Beatleweek in Liverpool. Dave Bernthal (George Harrison), Dougie Orr (Paul McCartney), Gary McAuley (Ringo Starr) and Stevie Hunter (John Lennon) will be playing all the hits and more from the early days of Love Me Do and She Loves You through to the psychedelic masterpiece of Sgt. Pepper, and classics such as Let It Be and Get Back. 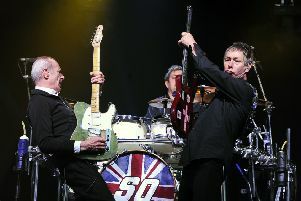 Every aspect of their performances have been perfected in their quest to emulate the Beatles, earning them rave reviews and making them one of the best tribute bands. Dave, who is from Dunfermline – where the band was originally formed and still rehearses – said they have been together for nearly a decade. He said: “Initially I was asked to cover for a Paul McCartney tribute band, and some of the guys from that band came together and that’s how Just Beatles formed. ‘‘So, while we have been playing together since 2009, Just Beatles was officially established in 2012. “It is an exciting show – we will be playing all the hits as well as some of the not so well known ones for the super fans who will know every single song. “We cover all the years of the Beatles from the early stuff right through to Sgt. Pepper, Abbey Road and their last gig on the rooftop which was the last time they played live.